This is required equipment for NATO U.S. Army participants. A minimum of two 1 quart canteens, with covers and at least one canteen cup, are required for US Army participants. The canteen nests into the canteen cup, the canteen cup nests into the canteen cup stand (optional and very useful for heating coffee off of trioxane tablets), the nested set goes into the canteen cover and that attaches to your load bearing gear. Not only are these correct for the era they are also very utilitarian. The canteen is easy to fill, not as prone to freezing up, and generally handy. The canteen cup is your coffee cup in the field and can heat your rations or coffee/cocoa when used with the canteen cup stand and a trioxane tablet. Early style cups have a simple handle that flips out from under the cup and is locked in place for use as a handle. While not as ergonomic for use as a cup, this style does excel when used for field cooking and is generally sought after by more experienced East Wind attendees. Later style cups have a pair of handles that fold flat against the side of the cup when not in use. This style does make a handier cup but when heating rations up over a small fire or a fuel tablet, the handles do not clear the heat source as well and as a result can become uncomfortably hot. Be mindful of cheap new manufactured canteens. Most are made in Asia and have a bad habit of splitting at the seam on the bottom. Take the time to find original canteens. Beware as well of reproduction Asian made canteen cups. They are usually made of aluminum rather than stainless steel and as such make extremely unacceptable cups for drinking hot fluids out of in addition to being hard to clean and of shoddy construction. 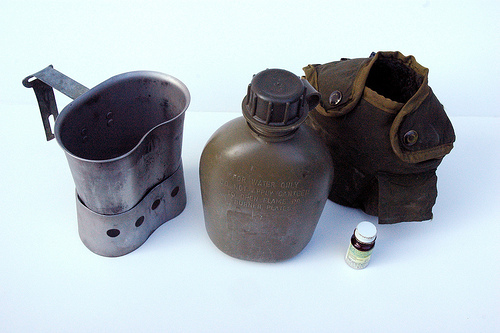 Other types of canteens such as the 2 quart bladder canteen, the 1 quart arctic canteen and the 5 quart bladder canteen may be carried as well but you must have at least two of the standard 1 quart canteens. Camel Backs are allowed if they are nondescript but are generally frowned upon. This page was last modified on 8 February 2014, at 10:03.